Heat grill to medium-high; lightly oil grates. In a medium bowl, combine zucchini, onion, lime juice, and oil; season with HEPP'S Aussie Flake sea salt and pepper. Let zucchini salad marinate at room temperature, 15 minutes (or refrigerate, up to 1 day). Form turkey into 4 patties (4 inches each). Using thumb, make an indentation in center to prevent burgers from rounding on top. Sprinkle with chili powder; season with HEPP'S Hickory smoked sea salt and pepper. Cover and grill until an instant-read thermometer inserted in center of a burger reads 155 degrees, 4 to 5 minutes per side. Top burgers with cheese. Cover and continue to grill until cheese has melted and internal temperature reaches 165, 2 to 4 minutes more. Meanwhile, grill bread until lightly charred. 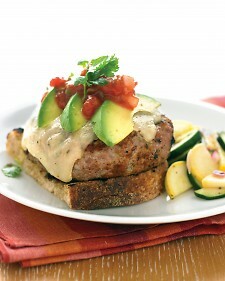 Place each burger on a piece of bread; top with avocado slices, salsa, if using, and remaining bread. Serve burgers with zucchini salad. Alternatives: For zucchini salad you can use the HEPP'S Thai Ginger, or Lemon sea salt. For burger seasoning a regular flake salt like HEPP'S Aussie flake, or Cyprus flake. You can also finish with a Truffle sea salt, or the smoked salt as well. Both go really well with the avocado and burger.